Cymatics - the effects that sound and vibration has on matter. Some know the shapes formed by sound from sacred geometry. Please share any knowledge about this. You need to be a Seeker of Sacred Cymatics to add comments! "May be what it really means is that reality is constructed with frequencies related to the Sun and Moon measurements." Ever since I saw the 5fold pattern of venus, which it traces around our earth when plotting conjunction points over time, clearly reflected in nature on earth such as the 5fold pattern characteristic of flowers on fruiting plants, and the highly symbolic pentagonal shape, I wonder how much of what makes up our perceptions of beauty, the forms in nature as well as mathematical harmonic rations, are directly proportional and bestowed upon our earth by core frequency patterns and relationship between celestial spheres. WillWillWill, could you please recommend a few books on Sacred Geometry and Cymatics? I am reading up on astrology and have a downloaded a few books on Sacred geometry as well. Any help will be appreciated. Mathematics is not my strongest suite, so a couple of books on basic astrology will be good too. Sacred geometry is in my opinion a great way to understand the patterns of nature, and the universe. It is also an example of the holographic universe. 2012 and Cymatic Fields in Space? The Constellation Orion is central to many cosmologies, myths etc. I ask myself why. I then thought "as above so below." I looked on Google Sky and at 180 degrees away from Orion along the celestial equator we find Ophiuchus the 13th sign(12 desciples + 1 Jesus = 13). Ophiuchus is the serpent handler or the healer, just a Jesus was a healer. 13 is half of the 26000 years precessional cycle. There are 13 Baktuns in the mayan calendar system. 29 Degrees below Ophiuchus is the direction of the Galactic center. This is a region between Scorpio and Sagittarius. This is the exact point where the Galactic Ouroboros serpent consumes its own tail. It represents death and rebirth. It should be no surprise that Ophiuchus the serpent handler is just above the Ouroboros. 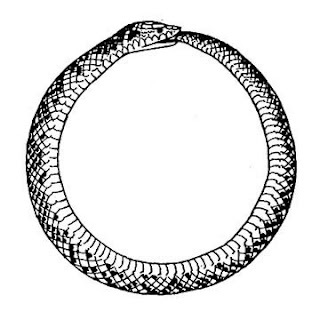 Would you be surprised that our solar system is moving in the exact direction of the mouth and tail of the Ouroboros. Nasa is currently studing this region of space and has found structure that they refer to as the Ribbon, or Fluff. IBEX is the name of the mission. This article explains some of what has been detected. "A strong, highly-tilted interstellar magnetic field near the Solar System"
For what it is worth, Nastrodamus is credited with the images below. 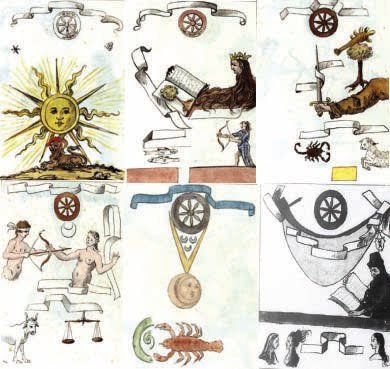 They clearly are referring to Sagittarius and Scorpio in relation to the precessional wheel. What is with the Ribbon thing? This magnetic field is tilted by 29 degrees, which is the same amount of degrees from the Galactic equator(Ophiuchus's feet) to the center of the Galaxy. 29 Degrees above the Galactic Equator and is just above Orions hands. Imagine a straight line from above Orion through our Sun going to the center of the Galaxy. This line goes 29 degrees above the plane of the solar system to 29 degrees below the solar system. It is inclined at the same angle of the magnetic field found in the interstellar medium in front of our solar system. Imagine an interstellar cloud with a magnetic field stretching from the center of the Galaxy through our Solar System to Orion. Imagine that this Field is Morphogenic. 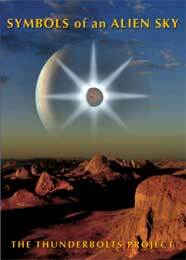 Imagine that in the near future cymatic frequencies will once again re-arrange our solar system and bring about a transformation of our world. May be symbols from an alien sky are what happens to a planets atmosphere when it emits the right cymatic frequency? Of course this would be caused by an external process, likely having to do with the harmonics of the interstellar medium and our sun. Using cymatics the Frequency of 432 Hertz creates equilateral triangles, which are integral to the Flower of Life and the Platonic Solids. Here are the different frequencies. "When A is tuned to 432 Hz the frequencies of the other A’s shift to 27 Hz, 54, 108, 216, 864, 1728 in other octaves. D becomes 576 Hz which becomes 9 Hz, 18, 36, 72, 144, 288, 1152 in other octaves. E becomes 324 Hz which becomes 81 Hz, 162, 648, 1296 in other octaves. etc etc." This is a good site to get the basics of cymatics. Visible geometric arrangement of fine Hexagon, 6 Triangles in vibrating sand. Note the star tetrahedron in the center of the above image. 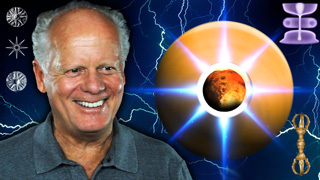 Can you doubt that vibration, energy and matter are tied together. When I saw the above numbers, I instantly recognized the numbers relative to time, precession and the platonic solids. Below are hertz in basic notes in different octaves that create cymatic triangles. Now let’s compare the above triangle creating cymatic frequencies with the platonic solids and the above factors of 6 and 36..
Tetrahedron has 4 sides with 180 degrees of angle per side making 720 Degrees total. Note the 18 and 72. Octahedron has 8 sides with 180 degrees of angle per side making 1440 Degrees total. Note the 18 and 144. Cube has 6 sides with 360 degrees of angle per side making 2160 Degrees total. Note the 36 and 216. Icosahedron has 20 sides with 180 degrees of angle per side making 3600 Degrees total. Note the 18 and 36. Dodecahedron has 12 sides with 108 degrees per angle and 540 degrees of angle per side making 6480 Degrees total. Note the 108, 54 and 648. Now let’s look at time. There are 3600 seconds in and hour,1440 minutes in a day 86400 seconds in a day, 2160 years in a zodiac age, 144000 days in a Mayan Baktun, 1080 parts to a Hebrew calendar hour. 1/2 of a Platonic Year is 12960 years, ¼ = 6480 years(the zodiac is divided into 4 parts), 1/3 = 8640 years. Let’s consider Astronomy for a moment. Diameter of Sun is 864000 miles, Radius is 432000. Diameter of Moon is 2160 miles, radius is 1080. The Earth is orbiting the Sun at a speed of 108,000 Kilometers per hour or 2592000 in a 24 Hour Day. D of Sun 864000 * 108 = 93312000, the distance of the Sun from the Earth. 93312000/360 days(many ancient calendars) = 259200, the number of years in precession * 10. The Solar System is moving through the Milky Way Galaxy at 72000 KM per Hour or 1728000 per day. Precession moves by 1 degree every 72 years. 72 x 360 degrees = 25920. A side note here is that in the Emerald Tablet of Thoth, the Moon is the Mother and the Sun is the Father. May be what it really means is that reality is constructed with frequencies related to the Sun and Moon measurements.